I think that the officials did a good job of situational awareness in trying to place the ball, make sure that both teams had enough players, get to correct spots for a field goal and all of this while players are rushing out for a last second field goal. All that aside, I think that the replay official should have made the call to stop action. It is definitely better to be right and stop play and give Baltimore the extra setup time, especially sense it was a -5 yards making it a harder kick, then to have been wrong and it being made. Replay official has no jurisdiction in this case. A challenge on the spot of the ball is only allowed when in relates to a first down and on a scoring (or potentially scoring) play. How come referees are never praised for all the correct calls they make over the course of a game? Instead they get heavily criticized for the few mistakes they make. Mike, How would you like to be an NFL official? Would you never make a mistake? People seem to forget that referees are humans. Steelers fan would have thrown a fit if Cundiff was allowed the time to set up and then make the 60 yard field goal. I am sick and tired of fans blaming the refs for everything that doesn’t go they’re way. The refs have a very hard job and do a very good job. 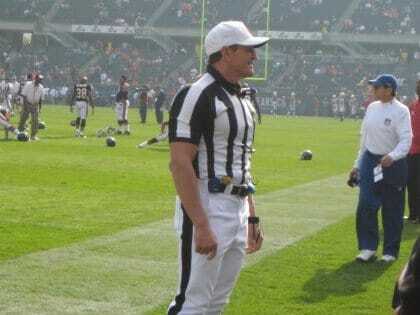 If you think you can do better, become an nfl official. Otherwise shut your big mouth and let them do their jobs. As I stated before, we pointed out the mistake in our game story (pressboxonline.com “Ravens Report” link) immediately following the game, but some of the posters make a good point: in the rush to get things set up for the FG, mistakes are bound to be made… I, for one, love replay because most of the time, it’s used correctly and the calls are eventually correct as well. But there are always going to be those times…. RP – I have been an official before and obviously all of these guys are human. The point of me posting this story is that there was a mistake made in the game and people were commenting on it. Posting a story on the 98% of calls that were correctly made wouldn’t get as many people to comment would they? If Cundif had made the field goal that was 5 yards closer then it officially should have been, I bet the Steelers organization and fans would have something to say about it right? Officials are not perfect, we all know that all too well in all sports, from Tim McLellan’s error in the baseball playoffs to the handball in the World Cub qualifier. Unfortunately for the officials, replays are seen more often, with better quality, and at slower speeds now then ever. This was not even a judgement call, they incorrectly spotted the ball. But my question is what would be the best way to handle this? The officials job is to get the call correct, and most of the time they do, but it’s the incorrect calls that gets everyones attention. Fortunately in this situation, the outcome of the game was not changed as the kick was missed. In addition to coming here to find out who’s working what game, it’s one of the things like about this blog – Discussing calls. There are current and former officials (myself included) and it’s interesting to see their perspective. Remember – It’s not personal, it’s just business. I would wager that a large percentage of the readers and posters here, do not understand or appreciate all of the time dedicated to this sport by the officials that goes untold. We had amateur coaches officiate a ball game ( baseball) only 1 restriction; they could not eject the officials coaching the game. All came away with a better understanding of the game. back as I’m trying to create my very own blog and would love to find out where you got this from or just what the theme is called. Appreciate it!